Definition: The Vacation Party Ghost is the reason why you should never be the last one at a party. The unknown apparition shows up in a photo of friends on vacation. In 1988 at a hotel in Austria, a group of vacationers gathered for a farewell party at their hotel bar decided to take a group photo. One of the party set up his camera on a nearby table and pointed it at the group. He set the self-timer on the camera and hurried back to the table. The shutter clicked and the film wound forward, but the flash didn't fire. So he set it for another shot. This time the flash worked fine. When the film was developed, it was noticed that the first photo showed a somewhat blurry extra head! 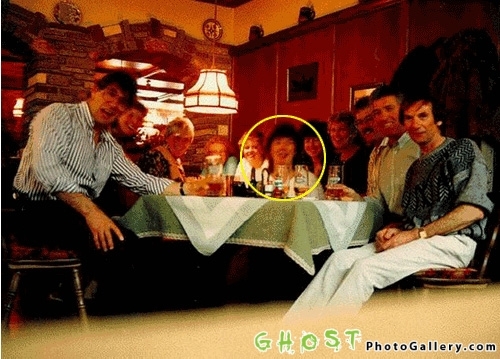 No one recognized the ghostly woman, and they couldn't figure out how her image appeared in the picture. A bit out of focus, the image is also too large compared with heads of the other vacationers. She seems to be sitting closer to the camera, which would put her in the middle of the table. Several photographic experts have ruled out double exposure as the cause, but the identity of this party crashing ghost remains a mystery.